Regarding the Merchants & Manufacturers Room (M&M Room), Don Rives, our Minister of Design, was given this instruction: “Design a room that would be the ultimate place to entertain a small gathering of your favorite people.” And that’s what he did. The room boasts a vaulted wooden ceiling, handmade floor tiles set between large heart-pine planks, a wall of enclosed wine racks, and herringbone masonry walls. It is furnished with a draw-table, high-backed leather chairs, an antique marble-top buffet, and tapestries. It is also where you’ll find the original oil study for the large mural in the Green Valley Grill. 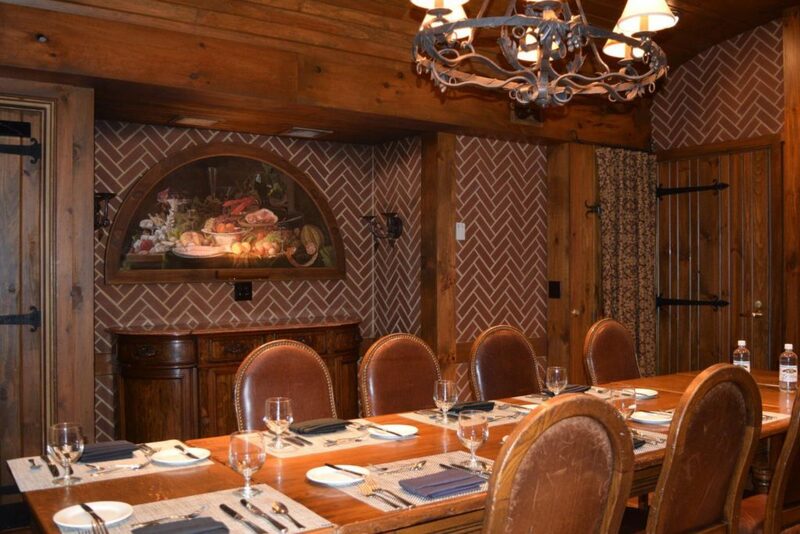 This room is ideal for elegant dining or a boardroom style meeting.